The Belmont Stakes - steeped in tradition. Wunderdog Sports has been handicapping the Belmont Stakes and providing horse racing tips and picks for many years. The Belmont Stakes offers the final chance to bet the Triple Crown and a great opportunity to witness greatness. We provide Belmont Stakes Picks and handicapping resources and advice for this race as well as other horse races. How will horses that fared well in the Kentucky Derby and/or Preakness do with the longer distance of the Belmont Stakes? It can be tough to tell. This race is usually a bit easier for the handicapper than the first two Triple Crown races. The field is smaller making it easier to identify potential winners. But, the schedule has been tough on the horses and trainers. 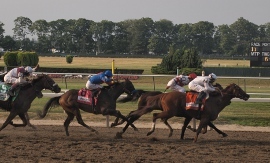 2006 Belmont Stakes Picks - Read About it now!